"There are times when no amount of persuasion, skill or use of some so-called infallible lure will make a fish strike. I believe that everyone who fishes will admit that, at least to himself if not to the public." Carl is one of those outdoorsmen who could not hide it if he wanted to. He exudes outdoorsmanship! He retired from his post as a forester in the White Mountain National Forest in New Hampshire several years ago to have more time to fish with his family. He has fly fished all over the United States with his sons, and wherever he is, when the talk turns to big fish, game, sportsmanship, Carl is in the midst of it all. 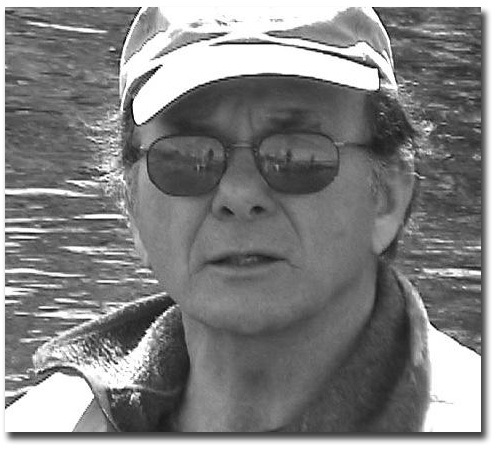 Carl is an avid fly fisherman that uses bamboo rods and does not go deep for salmon or trout. So his main Lake Winni fishing is in May and June when the fish are up top. He has been an exemplary Scout leader for many years and loves to pass on his love for the outdoors to youth, especially his own children. Fishing, and especially fly-fishing, has been a beckoning force during my entire life. I was raised in rural New Jersey and began my fishing career with a bent straight pin, cotton thread line and tree branch in a brook near home. 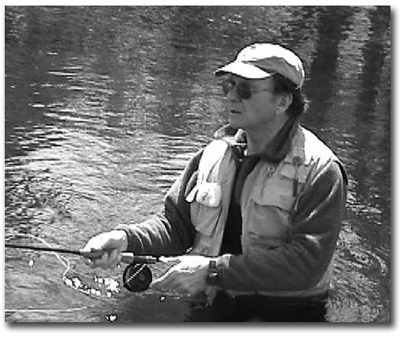 My fishing interest was inspired by three uncles, fly fishing, and long passionate discussions of fly fishing, fly patterns, fishing riffles, long pools and eddies, heavy insect hatches, and memories of long bicycle rides to the river, fly fishing, patched waders and three-piece bamboo rods. 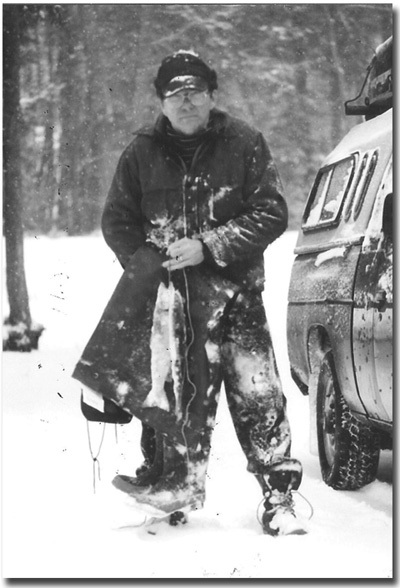 Fishing led me to a degree in Forest Management earned at Michigan Tech where the spring Steelhead and Brook Trout fishing was phenomenal although often more than a match for my old bamboo rods. A short tour with the Army interrupted my fishing career, only for it to continue after being hired by the US Forest Service. The next nine years in Missouri with the Forest Service were spent raising two sons, Ken and Jim and fishing the rivers and ponds for smallmouth bass and bluegill using bamboo rods. They became some of our most memorable years. Another career move brought us back to Michigan as project leader for the National Wild and Scenic River Studies of the AuSable, Manistee, Pere Marquette, and Pine Rivers, and the trout fishing was superb. Although this was a "desk job," it also required many long days and cold nights on the rivers, some of which was not always directly related to the project. A final transfer in 1980 to the White Mountain National Forest in New Hampshire introduced us to the many fine lakes, ponds and rivers of New Hampshire, and it was here that our boys taught me the true joys, and frustrations, of fishing. Meanwhile, fishing has drawn us to backpacking trips in Colorado and Montana. As luck would have it, our oldest son, a Fish Biologist with the Forest Service, reintroduced us to Steelhead fishing in Upper Michigan and recently relocated adjacent to the St. Joe River and Cut throat fishing in Idaho. I've been using bamboo rods and angling in Lake Winni in New Hampshire for 22 years, starting when I was 38. 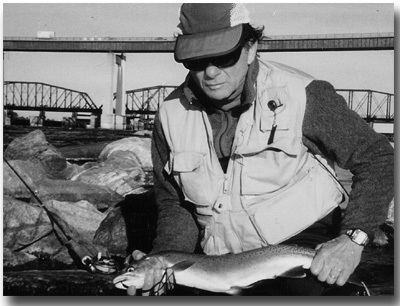 An uncle, John Gebhardt of Schenectady, New York taught me to fish. He spent a lifetime trolling for lake trout and rainbows on Lake George. He was constantly creating and modifying new techniques, equipment and fly patterns. I spent many long days in a boat with him using my bamboo rods, but probably learned and listened more intently in later years. 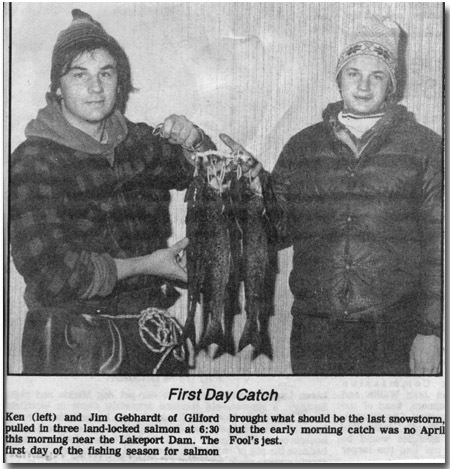 There were three uncles, Gottfried and John Gebhardt, who nearly raised me, and another great uncle, Joseph Kichline, who, unknowingly, inspired three plus generations of our family to become anglers. 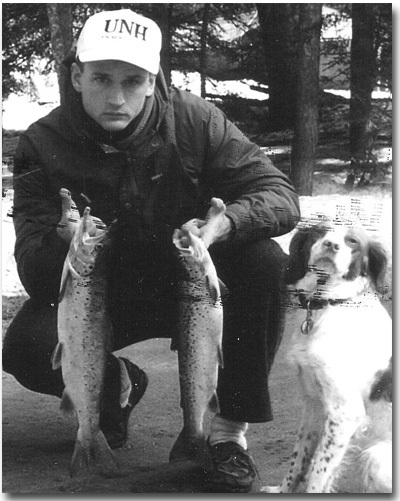 Each had a life long passion for trout fishing that was more focused on techniques, fly patterns in the water and experiences, than taking fish. However, there were always fish to eat and we certainly enjoyed them. I learned from them, patience and a profound appreciation for fly-fishing, rivers, lakes, and forests. What is my favorite Lake Winni game fish? Probably the landlocked salmon because they take a fly well and can be taken on fly tackle in rivers or from a boat. They are also an especially attractive fish and great eating. Which do I prefer, lead core, fly rod, or down rigger fishing for salmon and trout? Although I prefer wading and fly-casting on incoming rivers during the first few weeks of the season, we do very well trolling with a fly rod off the back and spinning rod and on a down rigger to the end of May. April and May on Winni and June – July on the ponds. And I love using my old bamboo rods in the early morning the best. Stories about the monsters I have caught? There were three extraordinary years during the late 1980s during which we - mostly my son, Jim - caught and released many large salmon and several very nice rainbows on the Winni and Merrymeeting Rivers. It was a strange and wonderful experience. Those fish ranged from 23-28 inches and were taken while wading on a Pinfish bucktail and small unnamed wetfly. Passing on to others your angling skills? I have passed my love for angling on to my sons, by example, support, and lots of practice. My top five tips for salmon? Morning fishing from 7-9 AM. Lightly dressed flies on single long shank hooks seem to attract the most strikes. However, we lose fewer fish on tandem hooks. Fly size and pattern may be more important than color, materials and precision tying. Long leaders or monofilament lines. Switch flies or lures often if they don’t produce. Don’t overlook that “short surface line” off the back of the boat. Yes, most of the time I practice catch and release, although I really enjoy eating fresh fish. There are fish that have taken a fly and fought so well that I hate to kill them. I might prefer to bring home several small injured fish, and I’m more likely to bring home a “stocked trout” than salmon from the lake. If I were New Hampshire Commissioner of Fish & Game, what initiatives would I take? Eliminate politics from Fish and Game management and follow the professional advice of our hired professional biologists. Consider the long-term impact of derby fishing. Although derbies may be an economic stimulus and bring people to the sport, they may need further study and perhaps greater restrictions. The decline of quality fishing is startling - particularly in the rivers. Above all let’s initiate and support efforts to protect and improve water quality and habitat, but let the “experts” tell us what and how that can be accomplished. Our sons are better storytellers than I am, but of course most of the stories somehow reflect humorously on dad and, of course, none of them are true. I have been caught in the boat, unfortunately on film, with my eyes closed, holding one of my bamboo rods, only momentarily while the boys caught and released dozens of fish. And somehow only dad can lodge a fly high in a tree and become hopelessly entangled in fly line during a heavy hatch on Sky Pond. I WAS SET-UP! That new fishing vest they gave me with “dozens of pockets” is appreciated but has become a source of their amusement as I frantically fumble through each pocket looking for some indispensable item at the height of the hatch. Only we can fly fish three-in-a-canoe during that heavy hatch with fish rising everywhere and only dad can manage to use his bamboo rods and entangle himself in fly line or hook a flying bat. Only dad would be up late, with his bamboo rods, on a hot humid night fighting mosquitoes while finishing that “bushel” of three-inch bluegills our young sons had to bring home to the table. I out-fished Jim once on a cold, wet, very snowy opening day when he was called to the riverbank and I moved into his riffle. I cherish the photo proof of that event. Time and wisdom have broadened our view and grandchildren have become a welcome opportunity to pass all of this onward, but this is what fishing is really all about. Memories and stories of the big fish we lost outlive those that we brought to net. And, although I readily dispense highly valuable advice to the boys, I probably listen and consider more of what they have to say now than ever before. Those salmon fillets wrapped in foil with a little cooking wine, sliced onion, lemon, and thyme are great either on the grill or in the oven they are just hard to beat.